We can fabricate any steel rule die, from a simple rectangle or circle, to a complicated gasket die. Customers in the finishing, corrugated, gasket and foam industries, among others, demand and receive a high quality steel rule dies which enable them to produce products superior to their competitors. At Paragon, close tolerance, high quality steel rule dies are the norm, not the exception. In fact we are so confident in the quality of our dies we guarantee every one we make. With our 2200 watt lasers, Paragon can produce two dimensional laser cut parts from a variety of materials. Because of minimal setup times, prototype and small batch runs can be produced faster and more economically than with conventional machining methods. If you need close tolerance parts with laser precision and quick delivery, Paragon is your laser cutting source. • Table Size 48" x 96"
The abrasive waterjet cutting process can easily generate almost any two-dimensional shape imaginable, quickly and accurately. We can easily generate parts from virtually any material from glass to granite with very precise tolerances; unlike lasers. Since it is a low temp process, we can generate parts without hardening the edges or warping the material. It also allows accurate cutting of heat sensitive materials such as plastics, fiberglass, laminates, gaskets, wood, rubber and composites without any heat induced stresses and distortions. Fully integrated CAD/CAM software driving the most accurate CNC rule processor in the market place today. Processes multiple rule heights from .750” to 1.250” in 2PT and 3PT center bevel, long center bevel and side face rule types. A double side broaching unit with fast change tool for doing miter-less joints providing more options for our dies and better quality. Cartridge based bending heads allow for fast change out from different rule thicknesses. Newly developed Bending heads matched with a partial pre-cut of the rule allowing for more accurate close tolerance bend radius and is final cut after the bending process for higher accuracy. 2-3 times faster than previous generation machines which means faster turn-around for our customers. • Rule cassette holds up to 8 different rule types for less changeover time. The Profile is a die tool routing system that generates all types of die cutting tools quickly and easily. Fully integrated CNC rotary routing system. 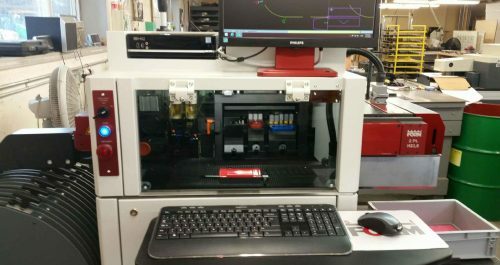 Capable of producing functional CAD samples from label stock to corrugated for prototyping. Ten tool ATC (automated tool changer) for cutting multiple tool paths of different types. Can be used to machine wood, aluminum, steel, plastics, paper, corrugated and dense foam from .005” to 2.00” thick. The Vacuum table surface allows us to hold + or - .001” on surface cuts and milling for the tightest tolerances possible.